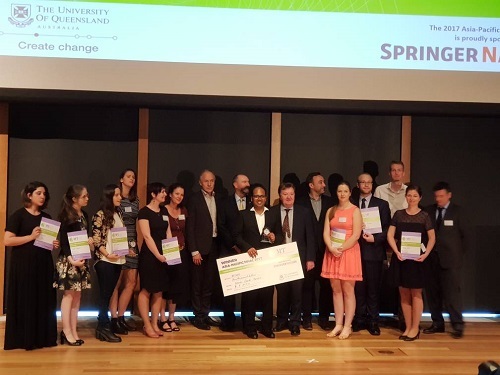 Ashwin said, he just couldn’t believe his thesis entitled Catalyzing Change: Light at the end of the Tunnel manage to draw the jury’s attention thus awarded him with $5000 research travel grant as well as funding and entry to the 2017 Falling Walls Lab Final and Conference in Berlin. “With full support from Institute of Post Graduates Studies (IPS), Dato’ Dr Hasnah and extensive training session with experienced trainer, Dr. Chiam Kee Swan and Normala Samsudin (CMLHS lecturer), really does helped to ensure all the research finding can be presented in 3 minutes,” he elaborates further. Meanwhile, UMP Vice-Chancellor, Professor Dato’ Dr Daing Nasir Ibrahim was very overwhelmed with this achievement. He really hope that this winning will inspire other students to participate in such program and share their research finding in a way that can be understand by others. 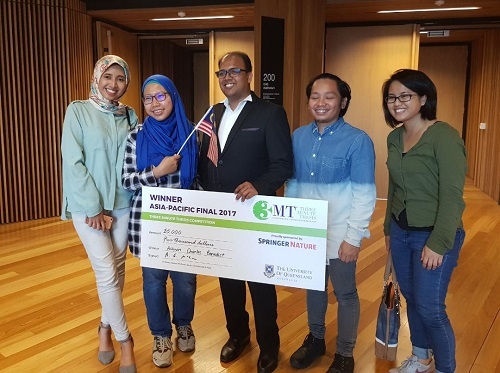 Together with Ashwin to the competition were Natalie Vanessa Boyou from UTM that represented Malaysia in the finale in Brisbane Australia.